The Brickade only has one main body color, the top and roof have a gold paint with a almost faded apperance. The middle has a light brown stripe and gold below it, on the bottom near the wheels it has brown paint. 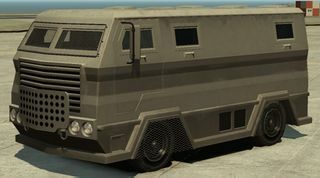 The Brickade can enter a [[Pay 'n' spray]], unlike most Police related vehicles, this only present because of it being a unfinished vehicle. The color near where the doors open and close can vary, being any color options the modded player put in the game. The door space on the Brickade is the only color that can be changed by mods.